The Dark Ranger: Instant offense? The Joks on you! The trade with the flames that sent Higgens and Kotalik to calgary definitely brought fire to the Ranger team... for the first period anyway. The rest of the way, they sort of just got burned by a Kings team that was young, fast and in a winning groove. Newly acquired Jokinen started the game at center for the Rangers while being flanked by Marian Gaborik and Vinny prospal. The thought being that this could be a legit first line that could capitalize on a variety of offensive opportunities. 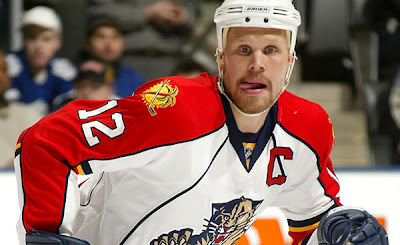 To his credit, Jokinen definitely seemed energetic and used his large frame to take the body. In fact it was quite odd to see a Ranger forward that aggressive and interested in playing the game. The same could be said for our other Calgary import, Brandon Prust. Prust, 2nd in the league in fights, definitely played his game and wasted no time in making his presence known as he racked up a boarding penalty (which was quite worth it in my opinion as I havent seen someone in a Rangers jersey deliver a hit like that in quite a while). Most importantly, the rest of the team seemed to be inspired and stepped up their level of play to seemingly impress their new teammates in the first as if trying to mask the fact that they have been slacking all this whole time. It would almost all seem to be for naught though as Vinny,Gabby and Olli worked on their chemistry for much of the night... while the Kings had an already queasy Lundqvist on edge in their shooting gallery. As the game wore on it became obvious that we were trying to keep pace with an LA team that just had more focus. Trying to project the same energy and keep the frantic pace was a good step in the right direction, but the difference was that a Kings team going for their 6th straight win was doing so by channeling their energy toward their offense and taking the body and much of our team was simply just committing the usual errors in doubletime and more aggresively. The second seemed to be a 20 minute long version of dueling penalties, with the relentless pressure of LA's offense pushing us to a pace we couldn't sustain for long, as evidenced by the shorty scored on a Kopitar laser of a shot on a break away turnover (There were NO defensemen on the ice during the man advantage). While we weren't done any favors by the refs who interpret the rules how they like, we didn't make much of a case for ourselves with our play. After weathering wave after wave of Kings forwards, we started to come on late in the game as a winded Kings seemed to relax a little. Gabby's coversion of a saucer pass, mid-sacuer, to score would allow him to keep his offense rolling, but it wouldn't be enough as we simply ran out of time before we could get ourselves back into this game. If theres anything that could be learned from watching the two latest additions, it's that we need to start playing like them before they start playing like us. I've always been amazed at how players that ride into NY bright and shiny, manage to leave the city with a dull finish that covers most of the players during their tenure here. While Prust picked up the instigator for his fight (I disagree with the call), he did what needed to be done... and thats what mattered. After a hit by Segal along the end boards on one of his new teammates, Prust sought out Segal after the whistle. Segal looked surprised to see Prust and rather reluctant to drop his mitts...Prust didn't care and took care of business and Segal was made to answer for his indiscretions. Prust didn't stand there mouth agape, watching things unfold *cough*girardi*cough*, nor did he have to muster up any false bravado before hand. He came, he saw, he conquered. It was business, then it was personal (during the punching), and at the end it was business again. As for Jokinen, his shock and dismay exressed at the trade and having to move his family, seemed to quickly turn into acceptance. While it didn't pay off on the ice last night, it's only been a game. He was however quick in his assesment and has said something that has been the Achilles heel of this team's offense for a while. A player without the training wheels mentality of using the boards to cycle the puck around and wants to work the prime real estate down the middle and around the net? Here, in NY? Good passing, good skating, good shooting and solid fundamentals is really the only way to go in making this team better. Team changing offense usually doesn't come in one player. It can come from one player but it must be played by everyone.